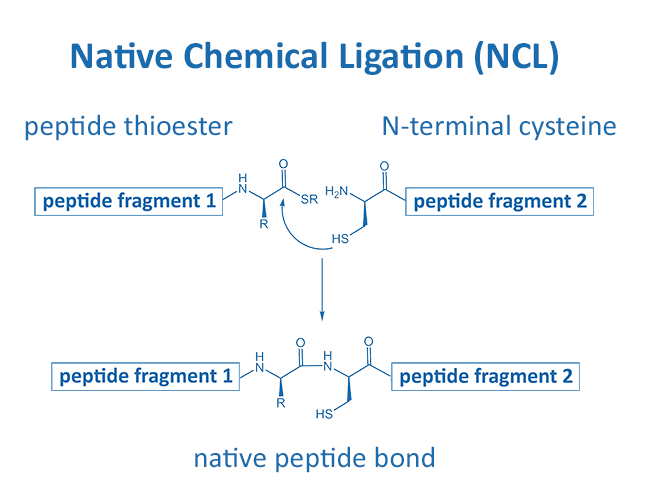 Introduced in 1994 by S. B. Kent, Native Chemical Ligation (NCL) is the most popular of the ligation reactions, particularly for the chemical synthesis of longer peptides or even proteins. The two necessary components are a C-terminal peptide thioester and an N-terminal cysteine. Both react via a transthioesterification step in order to form a native peptide bond. This reaction proceeds selectively in aqueous solvents at neutral pH. Such properties make NCL very suitable for biochemical applications. BIOSYNTAN offers different types of peptide thioesters, e.g. 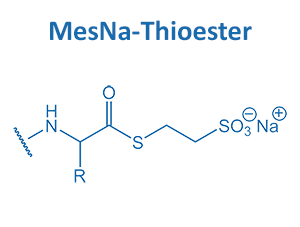 MESNa- or SEA-thioester. 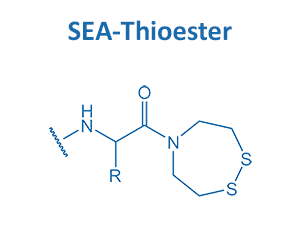 The SEA-thioester is delivered in the storable SEAoff-form, which is easily converted into the active thiolester by reduction with TCEP.